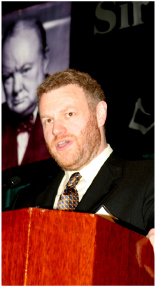 Mark Steyn received the 2005 Henry Salvatori Prize at our annual dinner in honor of Sir Winston S. Churchill. The event was held on Friday, December 2, 2005 at the Regent Beverly Wilshire Hotel in Beverly Hills, California. Mark Steyn, known for his witty and satirical style, is one of the world's premier writers on politics and culture. He describes himself on his website as "The One-Man Global Content Provider." His prolific work and world-wide fan base bear this out. Mr. Steyn's latest book is the forthcoming, America Alone: Our Country's Future as a Lone Warrior. His prior books include Mark Steyn From Head To Toe: An Anatomical Anthology, and The Face of the Tiger. His articles and columns have appeared in periodicals as diverse as the Wall Street Journal, Atlantic Monthly, Daily Telegraph, Jerusalem Post, National Review, The Spectator, Chicago Sun-Times, Toronto Globe & Mail, Irish Times, and The New Criterion.